Peas! With the warm weather we've had over the past several days you can practically watch the plants grow. The strength and perseverance of this tender little plants is evident in the second one from the bottom. See those chunks of earth it pushed through? The next two photos were taken within five minutes of each other, showing the bloom period of two different peach varieties. 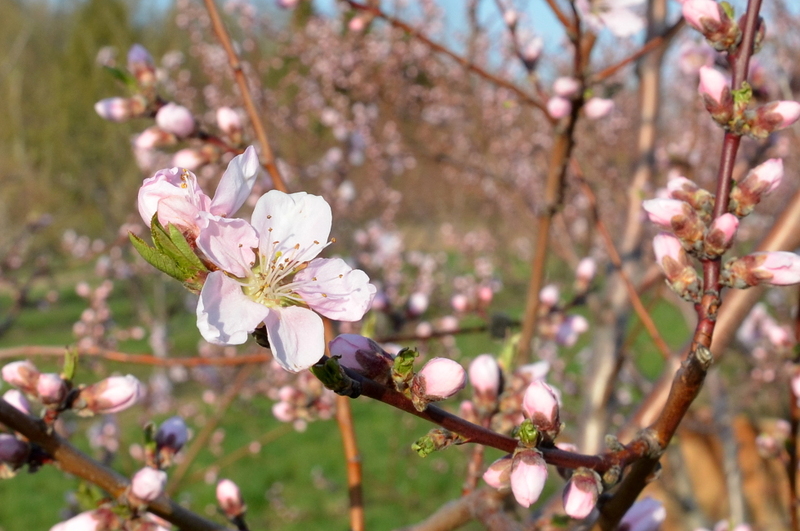 The earliest peaches are bursting into flower, while the later varieties are still clusters of tight little buds. So far, it looks like we'll have a good crop of stone fruit. Keep your fingers crossed that Mother Nature is kind for the rest of May! How about a quilt of lettuce? That's at least NINE different kinds, seeded in the greenhouse and headed to the field for planting soon. Our plan is to make variety bundles of three different kinds, something we're putting together especially for our CSA members (but we'll have it for our market customers too!). I can't wait to have a nice big bowl of fresh picked salad! Have you started your own seedlings indoors? What are you growing? Check in tomorrow for a sample of some of our favorite Spring blooming perennials!